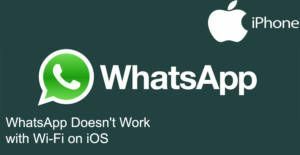 One of the common problems about WhatsApp on iPhone and iPad devices is that it is not work with Wi-Fi at times. We are going to provide some solutions for this problem on this page. We have already given tips for fix the Wifi connection problem on Android before. There are a few easy steps to get rid of this problem. Let us begin to give details to you. Close WhatsApp on your iOS Device. Wait for 2 minutes after you unplug the device. Replug your router and wait for the connection. Run WhatsApp on your device and check internet connection. You can use VPN services for such problems and there are many useful services on AppStore for that. Just go to App Store or iTunes and search for “free VPN”. You will get many results, we recommend you to use best rated free application for that. This problem also can be fixed with waiting for sometime. Somehow wifi connection problems on WhatsApp can be fixed by itself about 15-45 minutes later according to user reports. You also ensure that roaming is not active on your device. This can also create problems on connections. Since this problem is not related with your device or files or application, reinstalling Whatsapp won’t help you. There are several user reports that mentions they have reinstalled the application many times. It will be just a time lose for you. Do not use proxy connections on your phone, while you connect to WhatsApp. WhatsApp officially announce that, the app doesn’t work on proxy connections.